Which scholarly content to trust? As an Editor of an Elsevier journal, you work closely with authors and reviewers to ensure that articles have been thoroughly checked prior to publication. However, despite even the most careful scrutiny, corrections, updates and errata, as well as retractions and withdrawals, are sometimes still necessary. The challenge is that many versions of the article may still exist out on the web. Readers simply need to click on the logo and, if they are connected to the internet, a pop-up box will appear showing the current status of the document. This will work whether the reader is on the Publisher’s website, a third-party site or is viewing a PDF downloaded at an earlier date. The most common pop-up will be the message that the document is still current. Occasionally, however, readers will discover that the document has updates and a CrossRef DOI will link to the update on the Publisher’s site. We are aiming to roll this service out to all Elsevier journals. We began piloting it with 40 journals at the end of September and plan to roll it out to 1,250 of our 2,000 journals by the end of the year. Some journals have unique requirements and Publishers will be reaching out to those journals’ Editors to discuss these in the coming weeks and months. 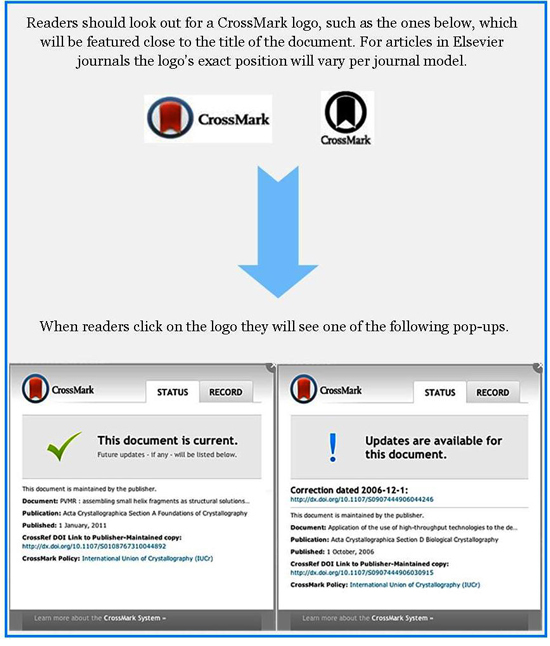 Find out more about the Elsevier Policy on CrossMark. Egbert is responsible for the design, development and implementation of improvements to the publication process of journal articles. The aim is to improve the experience of our authors, editors and reviewers in their interaction with us and our systems. We also attempt to adapt and innovate processes so that we are able to add more value to the whole publication process and to the final published articles. Egbert has been working with Elsevier for more than 20 years. Prior to his current role he worked in various positions in Publishing. He has a PhD in Theoretical Chemistry from the Free University Amsterdam.